Add these favorite content curation tips from 6 content experts to your content marketing mix. Like sharing a bottle of fine wine with friends, content curation enhances your relationships. Whether you’re a veteran content marketer or a content newbie, you need content curation to support your content marketing plans and improve your business results. Content curation supports your content strategy, your organization’s overarching content vision. It positions your business at the cross-section of your key goals. Additionally, content curation supports your content marketing’s tactical relationship building program. By enhancing and extending your content, content curation improves your content ROI. BTW, this is the second in a series of 3 content curation articles. Check out the first article: Key 2016 Content Curation Changes. Your content curation must be an integral part of your content strategy and content marketing to accomplish 3 content goals. Content curation strengthens your overarching content vision. It focuses on all content related to your key business goals and adds context. In the process, content curation establishes your brand and thought leadership in your selected niche. Keep your organization’s content top of mind. It highlights related content and spotlights older content in new articles and formats. Select and highlight other people’s content related to your key content strategy. By adding context you align your business with other influencers discussing similar topics. Focus on your key content topics. Consistency is essential. This includes your voice, frequency and platforms. Your goal is to own a specific position in your target audience’s mind without your logo. Content curation enhances your content creation and extends your content-related resources. As content marketing matures, this becomes important for maximizing content results. Spotlight relevant content from your archives. This helps readers dig deeper into your content offering. It helps keep them on your website or blog longer. Extend existing content offerings. Curate your own content to add value and drive new readers. Supplement your cyclical and crowd pleaser content offerings. Use lower resource curation options for new content. Hand select key content and add commentary. Link back to the original and observe fair use. Add content curation to other content offerings. Think beyond big rock content and pillar content. Add a curated emaling. Share your content on a regular schedule. Promote content beyond one week. Save time by batching shares over an extended period. Use different commentary and images. Spotlight other people’s content on social media. Don’t just push your content. Add value to your followers by sharing other people’s content. Republish existing content. Schedule timely content to attract new readers. 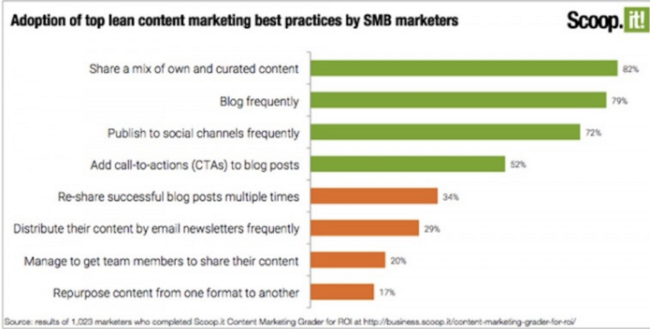 82% of respondents embraced sharing a mix of their own and other people’s content on their social channels according to Scoop.It content marketing best practices research of 1,000+ SMB marketers. While this basic content curation is useful, it’s far from sufficient for most content marketers. It doesn’t provide the necessary context readers need. It’s simple filtering that doesn’t support SEO or lead generation. Successful marketers embrace 2 easy-to-implement forms of content curation. Create new blog posts and articles. Quote and link to an article, infographic and/or video. Add at least 200 words of original insight to bring context and value to readers. Curated posts are faster than creating original content. With permalink on your blog or website, they aid search and social traffic. Develop a weekly round-up of the best content on a specific topic. Add your own commentary to provide context. Use this format for blog posts or email newsletter. At the very least, a content marketer needs to curate content for social channels. Only sharing your own content on social media is egocentric. Worse, it’s big turn-off for most audiences. Large list posts of purely aggregated content don’t add a unique perspective to the social media conversation. Sure, you can write a long blog post collecting all of the information on a specific topic. But before publishing, ask “What value does this give my audience if they can find the same information on the first SERP (AKA: Search engine results page)”? 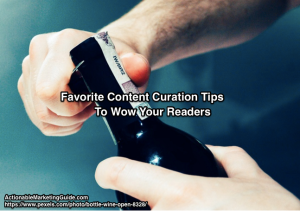 Curate all the content that’s similar to what you want to publish. BUT define your core difference when you provide your original commentary and context. Be knowledgeable about the breadth of content available. Know your audience. This includes understanding the type of information your audience really wants. As well as the format they want it delivered in. Cut through the information clutter. Provide real answers to difficult questions. Supply data, real-life examples (including successes and failures), and value beyond what others provide. If that isn’t your goal or you’re not putting in the effort to stand out, you’re doing it wrong. To curate content, there’s no ideal or preferred format. It depends on your audience’s context at the specific time. Use the 5 Ws. Who is the content directed to? Where is the content published? When is it going to be read and via type of device? An appropriate solution or strategy in a given context may to be applicable to another. A subject matter expert can benefit from content curation. Understand a high-value piece of content and add your own commentary. It can provide information to readers, while providing tangible proof of one’s expertise. To be honest, I don’t believe in any hard and fast rules when it comes to content curation. As I see it, it’s an organic process. It’s a function of the unique set of opportunities, challenges, skills, and resources that each business has to work with, and the unique needs and interests of the audience it’s trying to serve. What I love most about my job as a content curator is that no one in my company has done this before. There weren’t any templates or set patterns I was expected to follow. The sky’s the limit. It’s given me a tremendous opportunity to really examine the content assets we have at our disposal. I can discover what’s resonating with our audience, identify the knowledge gaps, and then tailor our curation efforts to fill those gaps in unexpected ways. It’s allowed our organization to be more flexible and responsive to our audience’s informational needs. Additionally it gives us a chance to experiment and branch out in new creative directions. Check out Content Marketing Institute’s latest ebook. It’s a great job of content curation. It provides existing information in a new format. 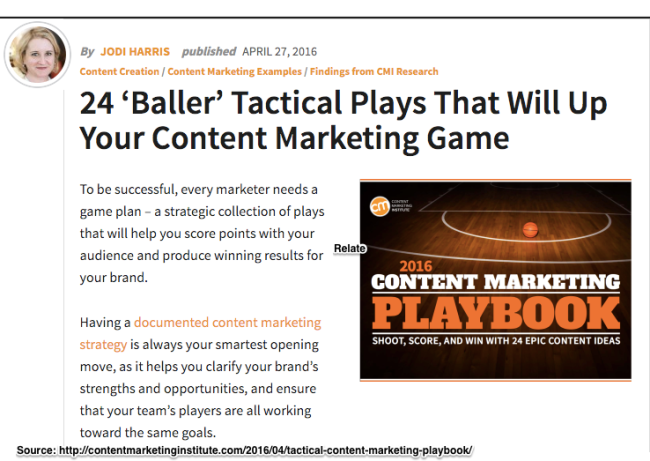 Take a page from Harris’s playbook and create a related blog post to introduce your non-book curated content. She uses the same image for consistency! While content curation is a key element of mature content marketing, there’s no one specific way to do it. These 6 content experts shared their favorite content curation tips. Content curation builds on and requires an established content strategy and structure to facilitate your efforts. Content curation doesn’t have to be overwhelming. Go deeper in your content niche. Add context relevant to your business and focus. Surprise your readers with content curation that offers new insights and presentations. Instead, lead your audience to action with content curation, yours and other people’s. Go on. Dip your toe into the content curation pool. How do you use content curation to expand your content reach? What works best for your goals and why? Tags Guillaume Decugis, Jodi Harris, Nathan Ellering, Pawan Deshpande, Robin Good, Tips. Bookmark the permalink. Hey Heidi, awesome post! Thank you so much for including us!